Thursday, December 3, 1914: Autoed over (in my dreams) and took several pictures of Ruthie’s school. Do hope they will be good this time. It sounds like fun to take pictures at your sister Ruth’s school. In your dreams, what kind of a car did you auto over in? 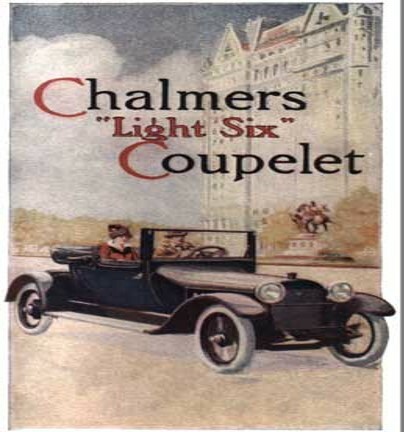 Maybe a Chalmers Light Six—According to the advertisements, it is as “safe and easy as an electric for a women to drive” (see number 6 below), but ever so much cooler. It is a manufactured—not an assembled car. Built completely in the Chalmers shops by Chalmers trained workmen under rigid Chalmers inspections. Easy riding. Long wheelbased-126 inches. Long flexible springs, main leaf of Vanadium steel. Rear springs underslung. Medium weight. Lighter than most fours selling at the same or greater price; heavier than any of the so-called “light sixes.” Scientifically tested for a four-fold margin of safety, yet light enough to be economical; no flimsiness—no unnecessary weight. Weight perfectly distributed, hence no tire destroying sidesway. Concentric torque tube and perfect spring suspension make car hold well to any road. Non-stallable motor. Chalmers-Entz electric starter won’t let motor stop. Greatest element of motor safety ever introduced. Makes car safe and easy as an electric for a woman to drive. Left-hand drive, center-control, entrance or exit from either side of car. Starter and ignition switch, electric light control, carburetor adjustment, gasoline and oil gauges, speedometer, on cowl board of dash. Motor and all lubrication points accessible. Big power; small motor. Chalmers built. Even the castings made in Chalmers foundries. Small bore, extra-long stroke (3 ½” bore by 5 ½” stroke) develops unusual power. Very large Tungsten steel valves. Will not warp or pit, so no power is wasted. T-head design gives the smoothness of the turbine—the flexibility of steam. Absence of vibration. All moving parts of motor perfectly balanced. Long stroke, six cylinder motor gives steady pull and sweet running. No intermittent power strokes pounding ceaselessly at bearings, cylinder walls, and gears. Upkeep expense reduced to minimum. All valve mechanism fully enclosed. Large oval cams open and shut with velvet smoothness. Perfect lubrication eliminates noise of operation. Simplest design of any “six.” Single unit ignition. Honeycomb radiator, cooling without complicated pump. Elimination of many moving parts cuts down weight and expense. A safe car. Frame of heavy, channel section pressed steel. Drop forged steering connections. Heavy artillery type wheels. Brakes 25 times as powerful in proportion to weight as those on a locomotive. Chalmers built axles of highest quality, heat-treated steel. Large bearings, positive lubrication, heat-treated gears, highest quality of materials insure least wear and minimum upkeep expense. Generously large. A “Light Six” but not a “little six.” Seats wide and deep. Ample leg room, both front and rear. Doors exceptionally wide. Luxurious upholstery. 1915 refinements. The “Master Light Six” is a year ahead in design. All moving parts enclosed. Transmission gears interlocking. Doors hung on invisible hinges. Doors flush fitting without moldings. Running boards clear. Gasoline tank can be filled without disturbing passengers. Fully equipped. Mohair top, quick acting curtains, rain vision windshield; five demountable rims; tire carrier at rear; electric lighting system with Chalmers combination headlights; speedometer, electric horn, license brackets, full set of tools, tire repair outfit. Faster selling “Six.” The “Light Six” is the most popular car ever built by the Chalmers Company. In April we shipped 1568 cars, an average of 60 cars per day. In this one month alone the public paid $3,000,000 for Chalmers “Sixes.” Buy the car the motor-wise have decided is best. Because it’s a Chalmers. This means that back of the Master “Light Six” stands one of the largest and strongest manufacturing companies in the United States. It means that the dealer you buy it from stands back of the car to see that you get satisfaction and full value. Price $1800: Experts say the Chalmers “light Six” is the greatest value ever offered at $1800. But mere figures can’t express the real worth of much a car to you and your family. Ask your wife if this isn’t the kind of car she wants. Ask her if it won’t be worth many times its price in health and recreation for the whole family. Take her with you to see the Master “Light Six”—together you will decide such beauty and value were never before offered at $1800. Posted on December 3, 2014 December 3, 2014 by SherylPosted in AdvertisementsTagged 1914. What an interesting ad! “Entrance or exit from either side of car. Gasoline tank can be filled without disturbing passengers.” When I first saw Chalmers in your blog title, I immediately thought of Allis Chalmers tractors; I didn’t know there was a Chalmers brand of automobile. All of those 20 points make we want to go out and buy one. Marketing is an amazing thing. I agree. . . It’s amazing how advertisements that are engaging and memorable can slip ideas past our defenses and seed memories that influence our buying behavior. I’m ready! $1800! Whatta deal! I thought about Allis-Chalmers tractors, too. There’s this bit of history that’s relevant. I’m sure that Thomas Chalmers and Hugh Chalmers are from the same clan, but I don’t have time to track it down just now. What makes a connection even more plausible is the fact that the Maytag company manufactured cars for a while, at about the same time. Everyone wanted to get in on the action. A hundred years ago the auto industry was at the stage where you could start manufacturing cars in a shed in your back yard and have some hope that it would be a successful endeavor. “Autoed” is such a fun verb. It’s too bad that it’s become archaic. Wow $1800 is worth $42,000 today according to the calculator I found in the link below! Wow, that’s a lot. It’s probably about what a Mercedes or Cadillac would cost now. The Chalmers must have been a really nice car. Look at the price! That was a lot back then. Still is to me! What a great entry ~ so creative in its own way.